West Dean Tapestry Studio is working on a tapestry conceived and commissioned by the Charterhouse; the almshouse and heritage site in London with a strong emphasis on learning. Uniquely but fittingly, the Charterhouse has involved a team of children from St John the Evangelist school in Islington to create the design, working with the internationally acclaimed UK tapestry studio's expert weavers. The project has been funded by Neil and Emma Redcliffe. The process is a democratic and accessible way to engage youngsters in a craft that is enjoying a contemporary resurgence. To create the design, Philip Sanderson, Tapestry Subject Tutor and Studio Leader at West Dean Tapestry Studio, and Trainee Weaver Ellie Rudd visited the Charterhouse and ran two workshops with year 5 pupils. Responding to the Charterhouses own tapestries showing biblical subjects, and purchased in 1616, Philip and Ellie taught the class about the methods of tapestry weaving and the history of the Charterhouse almshouse. From this, the children each created their own nautical designs inspired by one of the first Charterhouse residents George Fenner, who served as a sea captain under Elizabethan mariner Sir Francis Drake. The weaving of the design starts now in West Dean's internationally renowned studio, which is one of the only professional tapestry studios in the UK. The final piece will measure 1.5m x 2m and will take around six months to complete. All the tapestry yarn will be dyed in-house at West Dean and around 50 different bright colours and shades will be woven into the final design. The tapestry has been funded by the present Sheriff of the City of London, Neil Redcliffe. When finished, the tapestry will hang in the Sir John Cass's Foundation Learning Centre at the Charterhouse where the young artists will come and see it on display. Cynthia Adobea-Aidoo, Learning Manager at the Charterhouse, says: "We were delighted to be behind this project and host the workshop which Inspired the children Involved In this exciting tapestry project. It will be a fantastic modern addition to the Charterhouse tapestry collection, and Inspiring to future young people coming here to learn and create." The project is the latest in a long line of impressive work, including a collaboration with sculptor Eva Rothschild last year, five tapestries with Tracey Emin, and Martin Creed's Work No.1683 for What's the point of it? at the Hayward Gallery. The studio has produced work for clients including the Houses of Parliament, The Mercers Company, The White Cube Gallery and Great Ormond Street Hospital. Since 1976, West Dean's Tapestry Studio has worked with contemporary artists and designers to translate their images into woven tapestry. Since weaving 23 tapestries for The Henry Moore Foundation, the Studio also went on to work with artists John Piper, Howard Hodgkin, Eileen Agar, Matty Grunberg, Philip Sutton, Bill Jacklin, Adrian Berg. The studio has extensive experience of heritage tapestry projects, including The Hunt of the Unicorn, a series of seven tapestries based on 15th century originals commissioned by Historic Scotland. It was the biggest weaving project undertaken in the UK for 100 years, involved 18 international weavers and took 13 years to complete in 2015. The Charterhouse is a former Carthusian monastery in London, located between Barbican and Smithfield Market, and to the north of what is now Charterhouse Square. Since the dissolution of the monasteries in the 16th century the site has served as a private mansion, a boys' school and an almshouse, which it remains to this day. Neil Redcliffe, tapestry funder and recent Sheriff of the City of London says of the project: "Emma and I recently visited the children who designed the tapestry and were delighted by their enthusiasm and creativity. It was such fun to answer their well thought through questions about being Sheriff of the City of London and what it all meant." 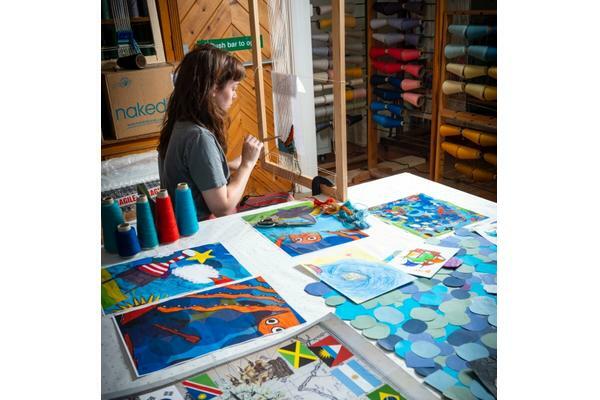 The professional studio is internationally renowned and one of the UK's only professional tapestry studios. The studio accepts commissions and collaborates with artists and designers. It is set within West Dean College of Arts and Conservation in West Sussex, one of the UK's foremost arts and conservation colleges with a rich crafts heritage and ethos of creative possibility.